This interview took place on: 2/3/11. JFH (Ryan Barbee): Alright I gotta know… is the album cover art real? Bryan Fowler: No it's not. [The photographer] actually took separate shots of each of us and it was just like normal day time shots and he made all of that. And like put us all in there. It's pretty nuts how it all happened. JFH (Ryan): Did you guys actually go to Alaska? ALL: No. No. No. We are! JFH (Ryan): When are you guys going? Stevan Vela: And some worship too. Bryan: I just want to go fishing. Ice Fishing. Stevan: I want to see an ice cap melt while a polar bear is on top of it. Josh Engler: And then you want to hear Al Gore talk about global warming. Bryan: I just want to meet… what's her name. Justin: Oh yeah! Let's have dinner with the Palins. JFH (Ryan): I'm pretty sure there's only like 24 people who live in Alaska? Bryan: Actually, I have an aunt who lives there. Stevan: Our cousin was based in Alaska for a year. Stevan: He helps us out. He's a fill-in drummer. JFH (Ryan): So what do each of you guys do in the band? JFH (Ryan): So what kind of instrument do you play? JFH (Ryan): Haha. I mean brand. Bryan: I have a Squire. (Ryan: No.) I do. I promise. Bryan: I have a Fender but I haven't used it in about a year and a half. I kind of modded it a little bit. JFH (Ryan): You guys gotta be freezing. You're Texas people. JFH (Ryan): So what are you guys actually doing in the music video? Bryan: Well we're gonna play music. Stevan: Haha. Well… we're starting out - Bryan is gonna be driving and Dave's gonna be in the back seat playing along with the song and they're gonna pick up Justin and I and then we're going to pick up Josh. And we'll be playing fake instruments *holds up a tennis racket* like this. Justin: We're just gonna kind of pretend and play air guitar. Be a little goofy. Stevan: But not too cheesy. JFH (Ryan): Now, I know previously on your album Searchlights the sound was more of an alternative album, but your new album is more pop; it's got that dance and groove. Where'd that all come from? Stevan: Well, we all kind of wanted that feel, I think, for the first album, too, but we just couldn't translate it as well. And then our producer Chris Stevens, he worked on seven of the songs on this album, he comes from a disco, funk background. He helped kind of hone all of our ideas and kind of compact it into some of the songs. We had a great time. JFH (Ryan): That's awesome. Now I know a lot of people say you guys sound like The Killers… do you guys like being compared to them? Justin: Yeah I mean we like The Killers. We love their music. Stevan: Not necessarily their lyrical content, but I mean they're pretty creative and they have a great sound. But we don't try to copy them at all; especially with this new record. I don't think you can really compare any of the songs. JFH (Ryan): Oh yeah! The only song that maybe could be compared was "Live It Out" but for the song "Feel It In Your Heart," it sounds more like Maroon 5. It's got a great groove to it. Bryan: We kind of pulled from some different influences like Passion Pit and things like that for it. I don't even think we were thinking of Maroon 5 when we wrote it. JFH (Ryan): So what is the process for you guys actually writing your songs? Stevan: Yeah we were playing in Dexter, Missouri and we had some free time and I had some ideas I put on Garage Band and I have like a ton of ideas and hardly any of them ever work. But I brought this idea and it had some melodies and chord progression and stuff and then we got together and start playing. Dave did some stuff on the drums that were really cool and Bryan and Justin did some lead stuff. Then Josh had this idea for the lyrical content from there. And it blew up from there. And when we got into the studio it just exploded. Justin: It blew up and then exploded? Justin: It explodes. I get it. I get it. Stevan: That's how I'm describing this song. Dave: In other words, he's saying we're cocky. Stevan: No, I'm giving more credit to Chris Stevens. JFH (Ryan): What is the whole theme of Control? I know there's not a song called "Control…"
Stevan: It's like a cry out to God when you have nothing else to say. Dave: "Talk to Me" is like the idea of trying to figure it all out. JFH (Ryan): Yeah I thought that song really connected well with the theme. John DiBiase said that "Help" reminded him of DC Talk's album Supernatural. Stevan: That's awesome! That's a great comparison. Bryan: We've had a lot of comparison to them recently, which is really cool because they were a huge monumental band in Christian music. Justin: Yeah and one of our big influences. Bryan: If we could follow another band in our industry, that would be the one. They did things that other bands didn't do and we feel like we're pushing the envelope; stylistically, lyrically, we're trying to be a little deeper and go places that maybe other bands aren't really going right now. JFH (Ryan): I think you're doing that. Bryan: It's hard to find that balance, you know. You want to be original and have something unique but you also want to be accessible and you want people to receive it. Dave: And you don't want to fall into the normal ways of doing things either. JFH (Ryan): Yeah, I really got that out of the song "Live it Out." You know, that Christians be Christians kind of theme. Bryan: Yeah, we wrote that song with a guy named Phil Larue. He had the idea on our way to our songwriting session. We prayed about and talked about it - about life and the Church and our faith… it just came out of that, kind of like a Bible study. JFH (Ryan): Yeah, and you guys wrote with Aaron Gillespie! How was that? Bryan: That was great! We wrote "SOS" with him which is the fourth song and "Push it Away." JFH (Ryan): And those are the more aggressive songs on the album too. Dave: Yeah. You can tell they are the rock songs on the record. Bryan: Those were the quickest writing sessions we've ever had. We got with him at B-Dubs and hung out with him for a little bit and then we went and wrote songs. We only planned on writing one but we finished writing the first song in like an hour, which is unheard of. And it was just acoustic. We weren't demoing it all out with like all the instruments and stuff; just getting a real vibe for it. And [Aaron] was playing this riff and Josh was messing with this idea for the lyrics. And it just kind of happened. It was cool; we just wrote these two songs in like two or three hours. It was great. JFH (Ryan): What did you guys do to get connected with your director? Dave: I think the label set it up. Stevan: He's worked with a lot of other artists. Bryan: Yeah, our label really just set it up. Stevan: Yeah, but I mean we looked and his videos and we liked him and said let's work with this guy! JFH (Ryan): Did he pick out Maysville, Georgia too? JFH (Ryan): We were driving here and I was like, "We are in the middle of nowhere." *laughter* So did you guys have anything to do with the theme of the video? Bryan: All him. His treatment and everything. We liked it so we just went with it. JFH (Ryan): What's the theme of the actual video? Stevan: We have these made up instruments and we're gonna be playing these instruments while we're in the car and it's kind of like we're still feeling the music even though we're playing with tennis rackets and a cheesy toy piano. And then we're gonna meet up all together and drive to another location where all of our real instruments and amps are and play together. It has a really cool vibe. JFH (Ryan): Very Cool. So, what's the story behind "New Years Day?" Justin: Josh and I wrote that with Ben Glover. We just started talking about life for like two hours before we actually started songwriting; just sharing the vision of the band with him, and him sharing different things that he was dealing with in his life. Just different life issues type stuff came out and that's where we were getting the lyrics for the song. The melody on the chorus was Ben Glover. At first it was pretty hard to get the flow for that song, but once we did it all started coming together. We love that song. It's one of my favorites. (Ryan: Yeah, you can actually worship to it.) Yeah… there's definitely an emotion in that song. JFH (Ryan): What's your favorite track on the album? Bryan: Mine is "Why Does it Take So Long?" Stevan: "Feel it in Your Heart." It's just upbeat and energetic the whole time. It's fun to play live. We've done it a few times at some shows. People catch onto the melody like that. It's awesome to hear them singing and celebrating life. Justin: It's a tie between "New Years Day" and "Why Does it Take So Long?" I love both of those songs. Dave: "Let Go" is my favorite. Bryan: I want to ask you a question. Let's see… What music influences you and what have you been listening to recently? JFH (Ryan): Um… a lot of Neon Trees. ALL: Yeah!! We do too!!! JFH (Ryan): Okay, how about you? JFH (Ryan): Favorite on the road food? Justin and Bryan: Thai food! Dave: On the west coast, In and Out Burger. Bryan: Stevan will say Greek. Stevan: He's been teaching us… well, like the album's saying about, control. Dave: The songs have really become a reality. Bryan: Every song on the record is basically our life over the past year. Basically, God's been showing us that we need to release that control. Dave: I think that's why people will really get this record. They'll see us. Searchlights was more about people going through something and this record is actually our heart on our sleeves showing a lot of hurt, frustrations, but still joy as well. Even when we run away, we can't out run His pursuit of us. JFH (Ryan): Any final words? Bryan: Flabbergast. Haha! We love Jesusfreakhideout! Stevan: Thanks for supporting our music! JFH (Ryan): What is the actual point behind the album? What inspired you? Josh Engler: What inspired us to name the record Control was stuff that was happening in life. The journey that we'd been on and life lessons that we've learned. The title is really a question, even though there isn't a question mark. The title is asking, "who has control?" Is it God or is it you? Paul says, "We must die… we must decrease so that He may increase." It's the art of dying daily and letting God take those places in your life. And that's kind of the journey we've been on. JFH (Ryan): Yeah, that's similar to what Dave said. Saying they were kind of becoming real. Josh: Yeah we started teasing each other; we had to be careful what we were writing about because it was happening to us. JFH (Ryan): Maybe you should start writing about earning a million dollars? Josh: Haha. Yeah. A lot of peace. There's a bit about struggle in the concepts on the record. Just that learning aspect; but it's growth. It's challenging, but it's growth. But we're grateful for those chances. You know your faith is strengthened when it's tested. So we're grateful for that. Josh: Yeah there's a dance element, a funk element. We just wanted to have fun with this record. We've been doing the rock thing for a long time. We settled into the alternative indie rock sound we had on Searchlights. With this one, we wanted to just experiment with different sounds and tones. I'm playing more synths now too. We really wanted to have fun on the album. JFH (Ryan): What's your favorite song on the album? Josh: I love all of them for different reasons. And since we haven't played all of them live yet. So I'm excited; looking forward to that! "New Years Day" is a really good song. I really like it for many different reasons. It was written out of the idea of someone coming to Christ and that being like a New Years Day and a turning point. So I'll go ahead and say "New Years Day," but "Live it Out" and "Feel it in Your Heart" tie for second place. JFH (Ryan): I'm not sure if this is the major point of the album, but I really feel that pull of the Church be the Church. Did that play a role in the album? Josh: That's a huge part of it. You know, when we let ourselves go: our selfishness, our humanness, our sinful nature, and when God starts taking over, we gain that perspective. And all the travel that we've done... most of us were sheltered as children. Most of us grew up in church so we were overexposed maybe to religion and sometimes tradition becoming religion rather than having a relationship with Christ. So it's just that cry to understand a Biblical worldview and see God's perspective on everything and be the church. And stop creating cliques where it's more of a social club rather than empowerment meetings to reach the world with the gospel. Recently, I went through this reformation and I said it in my heart, man, that I'd rather be at fault for loving too much than for judging too much. So that's kind of the mentality that is in our music. JFH (Ryan): It's one of those things that needs to be heard in the church. Josh: Yeah, instead of trying to handcuff someone to keep them from moral failure, work on their heart and their actions will reflect the inward state. It's not the sin that sends us to Hell, but it's because we haven't pursued Christ and accepted His work in our lives. That's the key, man. People who go to Hell don't want to be there. They choose to be separated from God. JFH (Ryan): Yeah, man. Well, it's been a pleasure meeting you. Any last words for Jesusfreakhideout? Josh: Thanks for being interested in our music. We're really grateful for that. We're just blessed, man. Thanks for coming out! 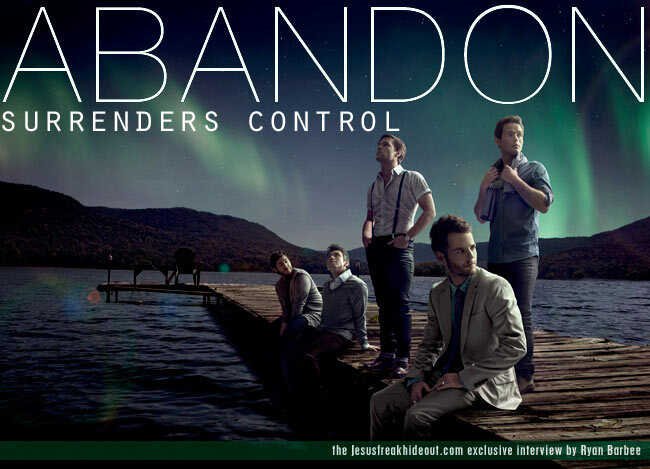 Abandon's new album Control is available April 19th, 2011.